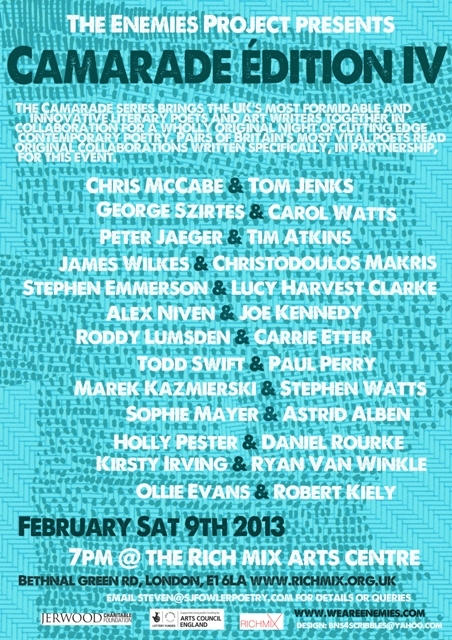 if p then q authors Tim Atkins, Lucy Harvest Clarke, Tom Jenks and Holly Pester all read this Saturday at Camarade IV. E. Tracy Grinnell is the author of Helen: A Fugue (Belladonna Elder Series #1, 2008), Some Clear Souvenir (O Books, 2006), and Music or Forgetting (O Books, 2001), as well as the limited edition chapbooks Mirrorly, A Window (flynpyntar press, 2009), Leukadia (Trafficker Press, 2008), Hell and Lower Evil (Lyre Lyre Pants on Fire, 2008), Humoresque (Blood Pudding/Dusie #3, 2008) Quadriga, a collaboration with Paul Foster Johnson (gong chapbooks, 2006), Of the Frame (Portable Press at Yo-Yo Labs, 2004), and Harmonics (Melodeon Poetry Systems, 2000). She is the founding editor and director of Litmus Press. P. Inman grew up on Long Island. His publications include: Ocker (Tuumba Press, Berkeley); Red shift (Roof, New York); vel (O Books, Oakland); ad ﬁnitum (if p then q, Manchester, UK); and most recently per se (Burning Deck, Providence). written, 1976-2012 is forthcoming in late 2013 from if p then q.